WATCH: DRUNK ON DUTY COP IN HOT WATER! A video of a drunk on duty cop is doing the rounds on social media. The cop was reportedly responding to a call out, when residents noticed that he was drunk. 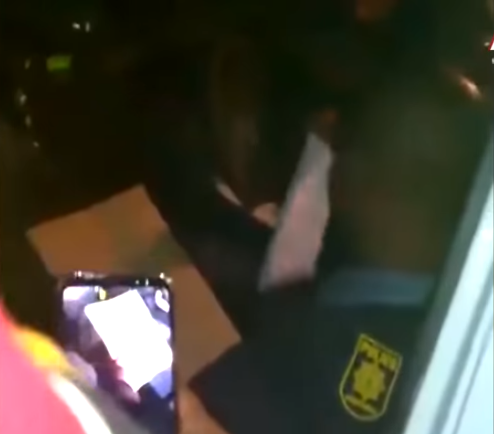 In the video, the officer can be seen inside the police van holding papers on his hands. Following that he tries to get out of the bakkie and seems to be unable to stand on his feet. In the background, one of the residents can be heard saying “You can’t even stand, yohhh…”. Police spokesperson Jay Naicker says the incident was immediately brought to the attention of his commander who booked him off duty and reported his conduct to the station commander. “Both he and the constable who was driving him on that day are under investigation. Although the driver was sober, the fact that he failed to act against his colleague is also viewed as serious misconduct and a senior officer has been appointed to investigate the matter,” Naicker said. Naicker said the constable in the video has been restricted to desk duties and his firearm was removed whilst he is under investigation. “We wish to thank members of the public that blow the whistle on corruption and misconduct within the ranks of the SAPS. We view such behavior in a very serious light and will always act against errant police officers as we believe that we need police officers of the highest caliber to deliver on our mandate”.